This iconic summer dish—and, as far as I’m concerned, it’s still summer—is one of many recipes for stuffed peppers in the Italian repertoire. Tuna Stuffed Peppers are a Neapolitan classic, while other recipes call for a vegetarian eggplant or bread stuffing. But today I’d like to show you how to make Italian Meat Stuffed Peppers, using a mixture very much like the one used in Italian cooking to make meatballs and meatloaves. This version makes for a fairly substantial dish you can serve as an antipasto or second course. Trim the bread of its crust and break it up into pieces Place the bread in a bowl and pour over enough milk and/or water to moisten the bread well. Let it sit for a few minutes to let the liquid penetrate. Place the rest of the ingredients in a large mixing bowl. When the bread is ready, shred it well with your hands and add it to the rest. Then—and here using your well-washed hands is the best way to go—mix everything together very well, until you have a uniform and rather soft mixture. If you like, you can test for seasoning by frying a small piece of the stuffing in a skillet and tasting it. Adjust the seasonings as you think best: a bit more salt or pepper, perhaps some more grated cheese, if it needs it. Now take a handful of the meat mixture and stuff all of pepper halves with it, making sure to pack the stuffing in quite well. It’s up to you how high you want to pile on the stuffing. Personally, I like to pile it on. Grease the bottom of a baking dish large enough to hold all the peppers in a single layer with a generous drizzle of olive oil. If you like, you can lay out a ‘bed’ of vegetables. This will hold the peppers in place and provide a nice accompaniment to them, almost a kind of a sauce. Cut up one or more the vegetables listed above into small dice and mix well with the oregano, salt, pepper and olive oil. Lay the seasoned vegetables out evenly on the bottom of the baking dish. Now place the pepper halves, stuffing side up in the baking dish. Top the peppers with breadcrumbs and/or more grated cheese. Drizzle everything well with olive oil. Bake the peppers in a moderate (180C/350F) oven for about 45-60 minutes, or until the peppers are tender and the stuffing cooked through, and the peppers have nicely browned on top. Remove the peppers from the oven and let the cool off before eating them. Italian Meat Stuffed Peppers can be eaten warm or at room temperature, but not piping hot from the oven. They are quite good—perhaps even better—the next day. Another—and in fact more common—way to stuff these peppers is to cut off the tops, trim out the insides and stuff them vertically. And instead of topping them with breadcrumbs and cheese, simply place the tops back on the peppers. Personally, I prefer stuffing the peppers ‘sideways’, so to speak, as illustrated in this recipe. For one thing, peppers don’t always stand up properly given their irregular shapes, but I also like leaving more of the stuffing exposed so it forms a nice golden, caramelized crust. But obviously, it’s up to you. More or less any kind of pepper would work in this recipe, except perhaps for some of the thinner ‘frying peppers’, which would simply not hold the stuffing. Bell peppers, however, are particularly well shaped for holding the meat stuffing. Many people seem to favor red bell peppers. Their taste compliments the stuffing very nicely. 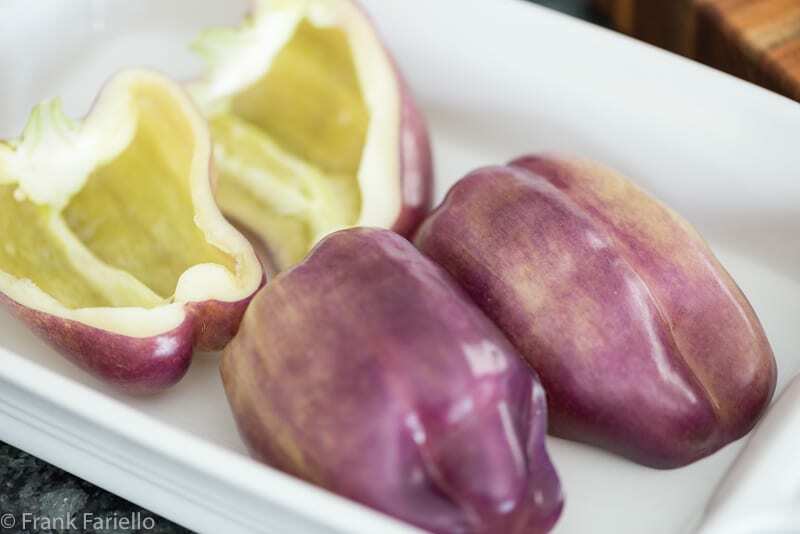 For today’s recipe, I found something I hadn’t come across before, purple skinned peppers. It was a curiosity, though they turned green when cooked, as the photographs show. Not sure I could discern any particularly unique taste profile. You want balance in terms of size. The peppers should be large enough to hold a fair amount of stuffing but I would avoid those ‘monster’ peppers you will sometimes come across. You want to be able to include a bit of pepper in every bite of stuffing, something you can’t do if your pepper is too large. Perhaps the most typical meat for stuffing peppers is beef, but you can mix the beef with pork—some recipes call for a bit of sausage meat or cured pork like mortadella—for a more savory result. And if you want to go ‘light’ with ground turkey or even chicken, even it wouldn’t be very traditional, why not experiment? You may have noticed that the recipes calls for the crumb of old bread (ie, bread without the crust), soaked in milk or water and crumbled, instead of breadcrumbs. This is the usual Italian method for meat mixtures for stuffings, meatballs and meatloaves. Italians generally limit their use of breadcrumbs to breading cutlets and such. This makes sense if you think about the days before commercial breadcrumbs when you were using actual bread in either case: why bother with the laborious process of grating the bread for crumbs if you could simply break it up and soak it? And, tradition aside, I do find that the Italian way produces a finer flavor and texture—provided that the bread has a good, firm texture like a good pane casereccio. (A softer bread would simply turn to mush.) But if you prefer, you can always use an equivalent amount of breadcrumbs, along with a few spoonfuls of milk, instead. As for many recipes, you should take the measurements given for the meat stuffing as a suggestion. Obviously, you may need more or less stuffing, depending on the size of your peppers. It’s better to make too much than too little. After all, you can always use the extra stuffing for making meatballs, or stuffing say a stray zucchini, or if you have a good amount left over, for making a meatloaf. Take a handful of the meat mixture and stuff all of pepper halves with it, making sure to pack the stuffing in quite well. It's up to you how high you want to pile on the stuffing. Personally, I like to pile it on. Grease the bottom of a baking dish large enough to hold all the peppers in a single layer with a generous drizzle of olive oil. If you like, you can lay out a 'bed' of vegetables. This will hold the peppers in place and provide a nice accompaniment to them, almost a kind of a sauce. Cut up one or more the vegetables listed above into small dice and mix well with the oregano, salt, pepper and olive oil. Lay the seasoned vegetables out evenly on the bottom of the baking dish. Remove the peppers from the oven and let the cool off before eating them. These stuffed peppers can be eaten warm or at room temperature, but not piping hot from the oven. They are quite good—perhaps even better—the next day. Another winner Frank. I’ve not seen the purple skinned peppers before. I take it from reading Nazneen comment that they taste the same as a green pepper. Really like the idea of using veggies as a base. Another place to get my zucchini into a dish. I can’t discern any difference in taste, to be honest, but those purple skinned peppers are pretty, aren’t they? Frank, although I often prepare vegetarian stuffed peppers this is more in light with what I grew up with. A meat mixture similar to what was used for our meatballs was the standard for stuffing and meatloaf. Generally, my mother and grandmother would add marinara sauce to the dish as well, but I like the way you suggest a bed of vegetables. Absolutely delightful! This dish goes right back to my childhood in Estonia in the Baltics . . . stuffed vegetables prepared very similarly were oft on the menu: usually a pork, beef and veal mixture being used . . . and, yes, the bread was always soaked in milk. And so remember walking into Roman restaurants at lunchtime to see these in cold display for primo piatti . . . . know they will taste as good here in rural Australia . . .
How interesting that they make such a similar dish in Estonia! Thanks for sharing your story, Eha. We still make these fairly often, Frank. I’m sure you read Stefano’s post this week – I think the next time I make them I will peel the peppers. I never thought of doing it before, but it seems like a great idea! Thanks for sharing. One of my favorite, summer recipe. Yummy yummy yummy! Such a beautiful alternative to gemista. We love how you share authentic Italian recipes that are so close to what we’re used to eat here in Greece Frank. This dish is another amazing example of this. It is interesting to see how many similar dishes there are! I remember when I posted about a typically Roman dish, tomatoes stuffed with rice, I got tweets from Greeks telling me that it was a Greek dish, which I guess it is. Make sense, though, since the two cuisines are working with a similar set of ingredients. What’s really interesting are the subtle and not so subtle variations across cultures. It would make for a fascinating study. Have a wonderful day ahead Frank! I think that could definitely be the case for the cooking of southern Italy (Campania, Puglia, Basilicata) etc. …remember that tomatoes didn’t appear in Europe until 1600. I don’t think Greece had a head start on Rome. Probably quite the reverse. Best! 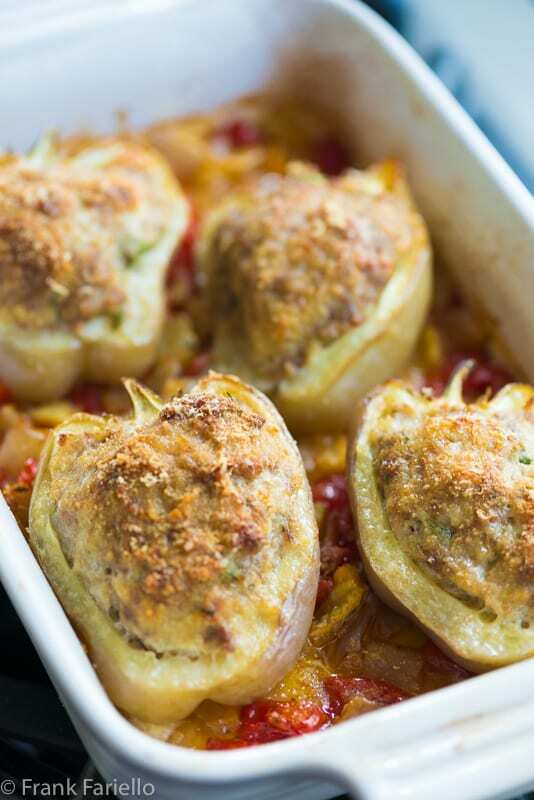 What a lovely stuffed pepper recipe! I make them occasionally but mostly the Asian style which doesn’t use bread crumb and replaces cheese with crated ginger. But I think it’s time for me switch up next time when I make stuffed peppers. Thanks for sharing! Thanks, Yi! I want to try that Asian version, sounds delicious. How did I miss this lovely recipe? Yet another Italian recipe I have not made or tried. I agree, I love the way they are stuffed sideways! It makes so much more sense (and easier to eat) than the ones I’ve seen which sit upright and what you said about the topping getting a bit more of a golden crust! Definitely! And glad I could introduce you to something new, Christina. I like those purple peppers too, though I wish they retained their pretty color after they are cooked. I agree with your choice os stuffing them sideways. When I moved to Milan, one of my room-mates made them and I loved them. My mother was not into stuffing vegetables, I think because she didn’t like baking. The only exception was rice-stuffed tomatoes, which she made often in the summer. I have a weak spot for stuffed vegetables: peppers, eggplant, zucchini, tomatoes, onions. Rice-stuffed tomatoes are really awesome. For some reason, though, I didn’t make them this year… and now it’s too late! Frank – we made these for dinner last night and they were fantastic. This is going in our regular rotation! That’s awesome, David. Glad to hear it! Coming over from David’s…you have some great recipes! I love stuffed peppers and these look like something I would enjoy. I’ve tried the purple peppers but they don’t retain their color or taste any different! Just like the purple beans and the purple okra! Perfect timing Frank. I have four or five peppers on the plant in my garden just waiting to be picked and stuffed! Sounds like we’re on the same wavelength, Linda. Hi Frank, thanks to David I found your blog. You have some wonderful recipes and I hope to make some soon. Thanks for stopping by, Gerlinde! And welcome to my blog. 🙂 Glad you like the recipes! Frank – I like your “sideways” version much better for the reasons you mention: they sit in the pan easier, and I prefer a crumb topping to simply adding pepper top. Also, am a fan that these aren’t stuffed with rice! Stuffed Peppers of this type were a regular part of our meals when growing up, down to the letter. Often my mother would make an ample amount for us to have the next evening. A simple yet ever so satisfying meal. I always freeze leftover stale bread, so I always have some to use in meatballs or meat loaf. Didn’t know not to use breadcrumbs until a friend taught me your method about a decade ago, though. Anyway, what a great recipe! I’ll eat this any time of the year — love its flavor. Thanks! Thanks, John! I’ll have to start freezing my old bread—I have to admit, I usually just throw it out if there’s no immediate use for it. Shame on me! I peperoni verdi hanno un sapore decisamente meno dolce rispetto agli altri tipi, è vero… Buon weekend anche a te, Chiara! I can say that this is a wonderful dish. Coincidentally, I prepared this for dinner last night and now I get your recipe in my inbox this morning. I prepared mine almost precisely as you — however mine were upright/vertical and I added just a bit of passata to the baking pan with the bed of veggies. Served with some garlic mashed potatoes. Delicious! Thanks Frank for your devotion to your site. I guess great minds think alike, Jim! 😉 A bit of passata sounds like a nice touch—will have to try that next time.